Are Matthew 24 and Luke 21 Parallel Records? End of Religion YouTube Channel? Author’s note: I am going to publish two versions of this essay, one that includes the referenced sections of scripture in the body of the essay, and another that does not include the referenced sections in the body of the essay but encourages the reader to keep their Bible handy and read these sections as I mention them. This way, the reader can enjoy whichever version works best for them. This will be the version without printed references, so here is you first chance—read Matthew 24, Mark 13 and Luke 21 now. The Olivet Discourse—Or Is It? In academic circles, Matthew 24, Mark 13, and Luke 21 are known as the Olivet Discourse. 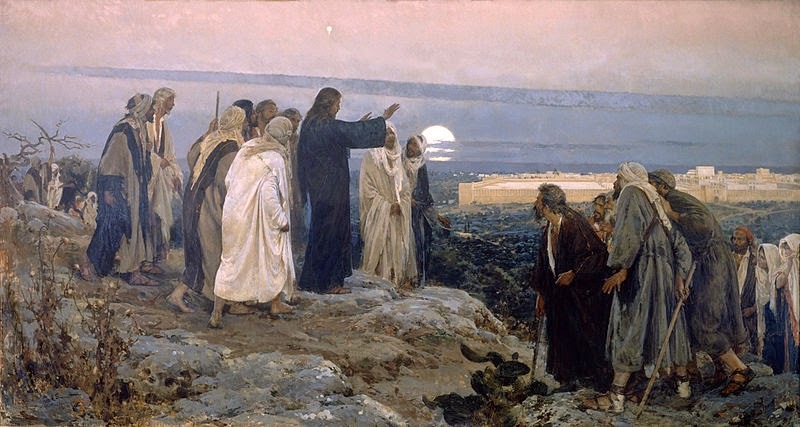 This is because the location the discourse took place was the Mount of Olives, or so we are told. To get straight to the point, the fact that all three sections are commonly referred to by the same title indicates that most scholars appear to believe that these are what are known as “parallel” records, meaning that they are simply separate records of identical events, and that variations between the records are insignificant enough to require them to be identified as records of distinct non-identical events. It is my belief however that these are not parallel records but are in fact records of separate albeit often similar discourses, and that the variations between the records are significant enough to require us to conclude that they are separate discourses. Furthermore, the ramifications of this hypothesis are significant. If these three records are indeed parallel, then this can logically lead to certain theological and eschatological conclusions. If these records are distinct however, then this leads to different conclusions. The first key point that must be made however is this—I do believe that the records in Matthew and Mark are in fact parallel records—the distinction lies between these two records and Luke. The record in Mark is essentially an abbreviated version of Matthew. There is little variation, and Mark is shorter and contains fewer details than Matthew. It will therefore be a convention throughout this essay to imply that the parallel idea in Mark is included whenever I mention Matthew, unless otherwise noted. Take a moment to re-read the three records again to see just how similar they can appear to be. But now, let’s look at the distinctions—distinctions I believe are significant enough that they require us to conclude that these are separate records of separate discourses. Carefully read Luke 21:1, and Matthew 24:1. The record in Matthew clearly takes place on the Mount of Olives, hence the convenient label Olivet Discourse, where Jesus briefs his disciples, specifically Peter, James, John and Andrew on the signs of the end of the age. In the Luke account however, Jesus is teaching the people in theTemple, and there are no details in the record that suggest he departed from the Temple before beginning his discourse in verse six. Carefully read Matthew 24:15 and Luke 21:20. Both records use the word desolation, but the similarity stops there. Matthew speaks of the abomination of (or, “that causes”) desolation, while Luke addresses the desolation of Jerusalem. Matthew’s abomination of desolation takes place in the holy place, while a central feature of Luke’s desolation is the entire city of Jerusalem being surrounded. In addition, both the Matthew and Mark records cite the book of Daniel as the precedent for this event, while Luke does not. Carefully read Matthew 24:6–9 and Luke 21:9–12. Even though the list of wars, rumors of wars, etc., is extremely similar, the other details are not. According to Matthew, these signs are just the beginning and after they happen Jesus’ disciples will be delivered to synagogues, etc. In the Luke account, the people are told they will be delivered to synagogues, etc., before these things happen. Additionally, in Matthew, Jesus’ disciples will be afflicted, killed, and hated of all nations, whereas the people will be persecuted, imprisoned,and brought before kings and rulers. Similar? Yes. Identical? No. Carefully read Matthew 24:16–21 and Luke 21:21–24. Matthew qualifies his statement that the events he describes are a season of tribulation or affliction like none that has ever been seen before—or ever will be. Luke does not make this qualification, he just says that there will be great distress. One possible consequence of believing that these are parallel records is a doctrine known a preterism, which is the belief that most, if not all, prophetic events described in the Bible have already taken place, primarily during the 1stcentury at the destruction of the Temple. The distinctions between Matthew 24 and Luke 21 present real problems for preterism however, and especially the distinctions cited here. The destruction of the Temple, although horrific, was not unprecedented. But even more importantly, the qualification in Matthew states that the tribulation that corresponds to these events will be the worst the world has ever seen or will ever see. The destruction of the Temple simply does not meet this criterion. Carefully read Matthew 24:16–21 and Luke 21:21–24. The gospels are widely considered to have different emphases. While all readers can benefit from the various perspectives, Matthew is generally considered as being delivered to a Jewish audience from a Jewish perspective, while Luke is considered as being delivered to a Gentile audience from a Gentile perspective. The Matthew record warns those who hear to pray that their flight is not on the Sabbath, a point that would only matter to Torah observant occupants of Judea. The Luke record makes no such reference. Altogether, this makes for a pretty convincing list of distinctions. Luke 21 was written to primarily Gentile believers who would witness the destruction of Jerusalem in A.D. 70. Matthew 24 is written to a future generation of Jewish believers who will witness the abomination of desolation. This is important in the debate between preterist/post-millennial believers, and pre-millennial believers. Preterists and post-mils claim that the events of Matthew 24 were fulfilled in the first century and therefore to expect a future fulfillment of these events is futile. A pre-mil believer on the other hand suggests that it was the events of Luke 21 as distinct from Matthew 24 that were legitimately fulfilled during the first century, but that the events of Matthew 24 (since they are an entirely different record) have yet to be fulfilled. The Luke record offers no assistance in understanding what the “abomination of desolation” (spoken of by Daniel the prophet) is, only Matthew and Mark’s records accomplish this. Preterism and post-millennialism hold that ancient Israel finds its continuation and/or fulfillment in the Church, and as a result it is very difficult for preterism and post-millennialism to not turn into subtle or even flagrant anti-Semitism. Partial and full preterism and post-millennialism are seeing a resurgence today, especially in certain charismatic circles. The arguments are rarely convincing to well-educated believers as they are usually an ad hoc mixture of pre and post-millennialism. Once the precedent of the prophet Daniel is understood, it is impossible to reach the conclusion that the abomination of desolation occurred at the destruction of the Temple in A.D. 70. The abomination of desolation involves defiling the Temple in a rather specific manner. In A.D. 70 the Temple was destroyed but not defiled in this manner. The implication here is international, even global. The events of Luke 21, circa 70 A.D. were localized or at most regional. While the tribulation of the Jewish/Roman War ~A.D.66–70 clearly included many deaths, not merely persecution and imprisonment, the clear implication of the Matthew 24 record is that far greater numbers will die. Another key distinction is in view here. Between A.D. 66–70 the Jewish nation was at war with Rome, resulting in the destruction of the Temple. In the Luke account all who dwell in Judea are encouraged to flee Jerusalem/Judea. In the Matthew account, “those who dwell in Judea” are encouraged to flee, but with an added distinction. The phrase “pray that your flight is not on the Sabbath” targets Torah observant followers of Christ—a very unique group indeed. When confronted with this inconvenient fact, most preterists quickly become “partial” preterists—those who believe only some of the prophecies of scripture were fulfilled in A.D. 70, leaving room for them to cherry pick which prophecies have been fulfilled and which have not. This point is examined more fully in my essay The Remnant and Israel’s Petition.